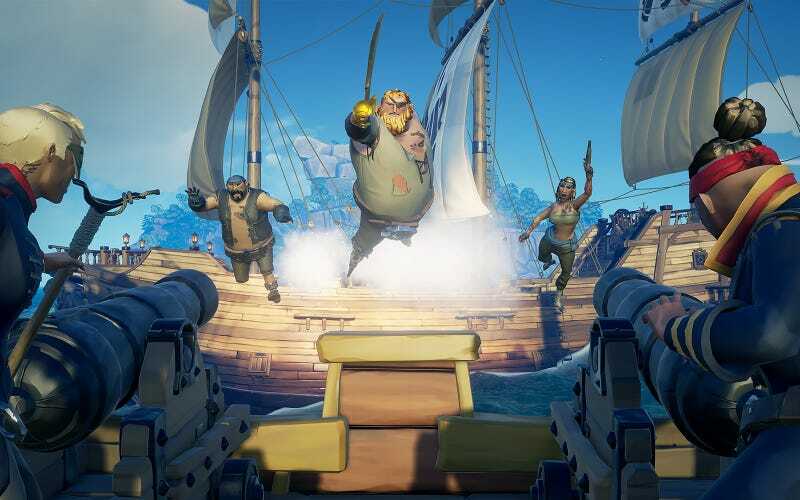 Sea of Thieves recently updated with The Hungering Deep, a questline that required players to team up to fight a giant shark boss to get cool new swag. I wrote that the mandatory cooperation had made the game much more friendly and peaceful. Well...it didn’t last long. A good number of players have back to blasting each other out of the water. The Hungering Deep emphasizes the larger problem with Sea of Thieves: cooperation and socializing is so much more interesting and fun than fighting each other, but fighting each other is just way more common. Like, I get it. Any forum or Reddit thread will remind you that the game is called “Sea of Thieves” and not “Sea of Friends.” You’re a pirate, not a boy scout. Sometimes pirates are assholes. And that’s fine! My main complaint is that is that 99% of the people you run across are assholes. Imagine for a second you’re at the grocery store and you get some tomatoes. They’re good tomatoes! You bag them and head out to the parking lot only to see that someone has trashed your car and stole the onions you got at another store. So you get a new car and head to a different grocery store, but on the way someone rams your car off the road and into a ditch. Imagine this happened every time you went out to the store. Now every time you go out out grocery shopping you’re always looking over your shoulder. You even start wrecking other people’s cars, lest they wreck yours first. Who knows? Maybe you can steal their tomatoes! Sea of Thieves combines the violent social Darwinism of Rust with the thrill of finding a perfectly ripe tomato at the local IGA. The real kicker is that most of these combat encounters don’t actually result in anything except wasted time, wasted resources, and maybe a sunken boat. It’s actually pretty hard to get the drop on a ship, board it, find the treasure, and successfully get it back over to your ship, dispatch of or evade the other ship, and then safely turn in the loot for yourself. And that’s with assuming the other ship actually has treasure to steal. Usually an encounter ends in messy fights at ports of interest and/or by having the loot sink to the bottom of the ocean with the enemy ship. Anecdotally, I don’t think I’ve ever seen someone complete a Skeleton Fort -Sea of Thieve’s equivalent of raids- outside of playing with a pickup group with full crews dedicated to farming them. Players will focus on killing each other while failing to combat the skeleton threat. They’ll lose the key to the treasure horde because it sank with the ship they just destroyed. One time I had a group successfully complete a skeleton fort only to have a sneaky suicidal rival blow up our ship with a powder keg on the way home. If he wasn’t getting that treasure, nobody was. Skeleton Forts by design are lengthy events that require good coordination or at least cooperation to complete successfully, but they mostly become another place for players to kill each other. Anyway, what I’m getting at is that PvP combat is hardly ever productive. It’s easily the least satisfying player interaction you can have in the game and yet it is the go-to action when dealing with strangers in Sea of Thieves. And I think there’s enough blame to place on both the game and the players for encouraging these interactions. Pretty much all of the“game stuff” of Sea of Thieves’s boils down to finding treasure and turning it in. It doesn’t really matter if you get that treasure by doing quests or by taking it from other players, both are legitimate means to the game. As such, it encourages players to be aggressive and try to take as much treasure for themselves as they can. There’s no real point in cooperation when you can simply have all the swag! But getting treasure isn’t what Sea of Thieves is about though. That’s just an excuse to get out on the ocean, explore the world, and interact with other crews. It’s the type of game where you have to think of the game world as a world and not just a game space. The problem is players don’t really want to do that. The reward for doing the thing is more important than doing the thing. Sea of Thieves isn’t the only game that has this problem. Like, I looove me some Destiny 2. Running Strikes is some of the most fun you can have in the game, but you always get that one person who ignores the firefights and rushes ahead to the boss and the reward. The same goes for World of Warcraft dungeons or basically any PvE mode in an MMO. If a game has a shiny something just past some hoops, you can believe gamers are going to jump through them with the speed and vigor of an Olympic gymnast. We’ve just been conditioned to do that for years. Heck, I’m guessing most people just looked up all the locations you need to go in The Hungering Deep instead of solving the riddles themselves. But the strength of these games aren’t really their reward cycles. That’s just stuff that gets you hooked on playing. The real fun lies in the adventures and stories you have along the way. And a big driving force for those stories in games like Sea of Thieves is interacting with other people in meaningful ways. The Hungering Deep questline was a perfect example of how these types of interactions can be so much fun! I started the quest with the help of a friendly player chilling on Shark Bait Cove. I ran into another player while on the quest and teamed up to search for the entrance to a secret cave. I met a another player at a different quest location. He offered me a cannonball and said “the pact is sealed” when I accepted it and swam of into the horizon. I piled into galleon with total strangers to fight a giant shark. After the fight we added each other as friends. Did you know that there’s an emote in Sea of Thieves that can actually be used to add someone to your friend list instead of opening up the Xbox app? I didn’t, and I’ve been playing the game pretty regularly since release! So it’s really frustrating going back to the same old Sea of Thieves again just under a week later. Players have gotten their rewards, so what’s the point of cooperating anymore? Worse yet, all these people now know where the people who still haven’t completed the quest need to go, making them perfect targets for piracy or griefing. It’s like watching a bunch of beach bullies team up to create a magnificent sand sculpture and then minutes later they go back to kicking sand in each other’s faces. After all, they’re called “beach bullies” and not “beach friends”! If The Hungering Deep left any lasting impression on me it’s that Sea of Thieves is kind of broken the way it is now, at least when it comes to it’s social interactions with strangers. I don’t think it’s something that can be solved by just adding more stuff in the world. Without a massive overhaul in how the game doles out rewards or a change in how players engage the game with other players I’m afraid the interactions in the game won’t ever evolve beyond bloody battles. I know it’s possible. Sea of Thieves has only been out a few months. Games like Elite Dangerous or even No Man’s Sky have taken years to establish player-run governments or larger community objectives that really set those games out in the “Here’s a World, Do Whatever” genre. Sea of Thieves has good bones and the base game is actually great fun with friends or for solo relaxation sessions. Rare and the community just need to step up and animate those bones into the undead pirate skeleton I know it can be. Zachary D Long is available on the high seas of Xbox and Twitter as invadingduck. He’s currently trying to get people to join his cult to the Big-Head God on Discovery Isle and help people while dressed as an admiral. It’s not going too well.